Bee And Insect Stings In Children. Information on yellow jackets, hornets, ants, fire ants, wasps, venom, anaphylaxis, anaphylactic shock, and epinephrine. Allergic reactions to bee and insect stings are potentially fatal. Bee, wasp, and insect stings cause more deaths in the United States than any other kind of envenomation (injection of venom). Wasps and bees cause 30 to 120 deaths each year in the U.S. Most deaths occur in people 35-45 years of age. Fifty percent of deaths occur within 30 minutes of the sting. Stinging insects are most active during the summer and early fall. Yellow jackets cause over 95% of the allergic insect stings in this country. Ants sting 9.3 million people each year. 1) vespidae, 2) apidae, and 3) formicidae. 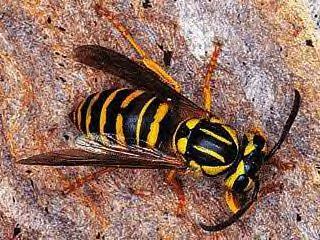 The vespids include yellow jackets, hornets, and wasps. The apids include honeybees and bumblebees. The formicids include the stinging ants. These ants sting repeatedly in a circular pattern, while holding on with their mouth. Hymenoptera are social creatures that sting to protect their nest, hive, or colony. Yellow jackets nest in the ground, and are easily disturbed by lawn mowers and other yard activities. They are very aggressive stinging insects. They are attracted to picnic areas, garbage, sugary food, and soda cans. Hornets form large paper nests in trees and shrubs. Wasps are hairless and have a narrow “waist.” They form paper nests under roof overhangs and eaves of buildings. Wasps feed on nectar and arthropod larvae. Honeybees have hairy bodies, and leave their stinger behind after they sting. They are not naturally aggressive, however. Their beehives are large. The Africanized “killer” honeybees are more aggressive, and attack in swarms. They fly at only 4 miles per hour, allowing most victims to flee. Imported fire ants build earthen mounds that may contain more than 100,000 ants. They attack in large numbers. Infants and elderly people are at risk for being attacked by fire ants because they have limited mobility. HOW DO BEES AND INSECTS STING? 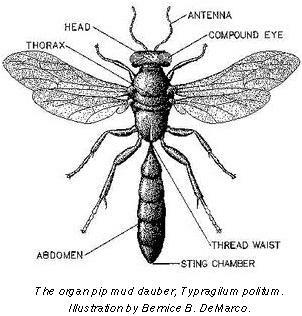 Bees and wasps have a stinger that is a modified ovipositor. They puncture the skin with a hollow stinger, and inject the venom into the victim. Bees leave their barbed stinger in the skin, along with the attached venom glands, nerves, and muscles. This action eviscerates the bee and kills it. Nearly all of the bee sting venom is injected within 10 to 20 seconds. For this reason, it is very important to remove the stinger as soon as possible – by any means necessary. Vespids, on the other hand, have a smooth stinger, which allows them to sting repeatedly. Fire ants (Solonepsis invicta) attack in large numbers, inflicting thousands of stings and bites to victims unable to escape. 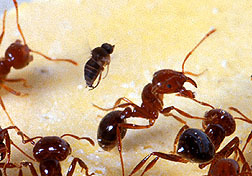 Fire ants bite with their mandible (mouth) – then sting repeatedly in an arc around the bite site. Their stings develop into sterile pustules, and then rupture. Infants often scratch open fire ant wounds, which causes secondary infections. Severe anaphylaxis has been reported in up to 4% of imported fire ant stings. Toxic reactions occur when a large number of ants sting an infant or elderly person. The venom of winged Hymenoptera (bees, wasps, ants) contains over 30 individual components, including: proteins, peptides, biogenic amines, and enzymes. All venom allergens are proteins, and most of them are also enzymes. antigen 5, histamine, phopholipase, bradykinin, dopamine, acetylcholine, and serotonin. Fire ant venom is 95% water-insoluble alkaloid, and 5% water-soluble allergenic protein. The alkaloids do not cause an IgE antibody response, however. Hymenoptera venom initially acts by disrupting the cell membranes of the body. The vasoactive amines – hydroxytryptamine, histamine, norepinephrine, and dopamine – are responsible for local sting reactions. Most serious reactions are caused by true IgE allergic mechanisms that activate mast cell degranulation. immediate usual, large local, systemic anaphylactic, toxic, or delayed reaction.. Pain, erythema, and swelling at the sting site. This normal reaction resolves within a few hours. It is cause by the venom’s vasoactive amines. More extensive swelling and erythema around the sting site. The reaction may take several days to resolve. It may be misdiagnosed as cellulitis. The most severe response. Classic IgE-mediated reaction. Fatalities are usually caused by airway obstruction or shock. Most fatalities occur in adults. This is the result of the physiologic effects of very high concentrations of venom - which occurs after multiple bee, ant, or wasp stings. It usually causes vomiting, diarrhea, headache, and fever. It may occasionally cause hemolysis, rhabdomyolysis, or intravascular coagulation. This problem may develop several days after the sting. A child may develop influenza-like symptoms. Anaphylaxis is an extreme reaction of the immune system. It is the most serious response to a bee or insect sting. It has very profound respiratory and cardiovascular effects, such as airway obstruction and severe hypotension. loss of consciousness, shock, swelling of the lips and eyes, hives, and dizziness. Anaphylaxis occurs with 0.5% to 1.5% of stings. Death from a bee or insect sting almost always occurs within the first hour. Airway obstruction is the most frequent cause of death from anaphylaxis. IgE antibiotics can be produced to a variety of allergen, including bee and insect venom. IgE antibodies are bound to mast cells and circulating basophils. Re-exposure to the venom leads to “mediator release” when the mast cells and basophils degranulate. Histamine is the most common preformed mediator in mast cells. 1) Remove the bee stinger as quickly as possible – by any means necessary. Pinching the stinger to remove it is also an acceptable technique, since time is of the essence. 2) Check the child’s airway, breathing, and circulation. 3) Apply cool ice packs, or apply a paste made of baking soda and vinegar. 4) Elevate the arm or leg to limit swelling. 5) Give acetaminophen for relief of pain. 5) Inject the child with his epinephrine auto-injector if needed. the child has hives all over the body. 1) Assess the child’s airway, breathing, circulation, level of consciousness, and capillary perfusion. 2) Measure and record all vital signs, especially blood pressure and body weight. 3) Administer aqueous epinephrine (1:1000) at a dose of 0.01 mg/kg if anaphylaxis is suspected. Epinephrine is injected intramuscularly, subcutaneously, or sublingually. This dose can be repeated every 15 minutes if necessary. 4) Administer an antihistamine (diphenhydramine) orally, or by injection at 1 mg/kg. 5) Provide an initial IV bolus of 10-20 ml/kg of isotonic crystalloid, in addition to the epinephrine and diphenhydramine. intructions on avoiding stings, information on obtaining a Medic-Alert tag, a prescription for self-administered epinephrine, and a referral for an immunology evaluation. Be very careful with food and open soda cans. Do not drink from open beverage cans outdoors, because this attracts insects. Avoid exposed food or garbage at picnics. Keep garage and patio areas clean. Keep garbage cans tightly sealed. Do not allow your child to walk barefoot or wear sandals outdoors. Give your child shoes to wear. Give your child a hat to wear outdoors. Avoid wearing floral patterns or bright-colored clothes outdoors. White and khaki are the best colors for preventing insect stings. Avoid using hair spray, wet-smelling perfumes and colognes. Make sure that your child avoids rapid movements and arm-flailing when near stinging insects. Do not use noisy equipment, such as lawn movers within 50 years of beehives, or within 150 yards of Africanized bee colonies. Remember that most insect repellents are not effective against stinging insects. An article in The Medical Journal of Australia describes a patient with anaphylaxis as a result of S. invicta (imported fire ant) stings, and documents his treatment. Solley GO, Vanderwoude C, Knight GK: Anaphylaxis due to Red Imported Fire Ant sting. The Medical Journal of Australia 3 June 2002 176 (11): 521-523.